For our upcoming trip to LA, we're looking at hotels like Sofitel, The London and SLS. We were also wondering about smaller, but still upscale, hotels in the West Hollywood/Beverly Hills area that might be a bit less extravagant. Can you help? AVALON HOTEL: A retro (well mid-century modern) vibe pervades at this motel-style, Kelly Wearstler-designed Kor Hotel. Angelenos love a hotel bar and Blue on Blue is no exception, as the cool little pool/cabana area attracts locals and visitors with yummy martinis and a chilled out vibe. I've downed many a martini there myself. Good times. THE CRESCENT HOTEL: And speaking of great outdoor cocktail spots, The Crescent's deck is half-restaurant and half-drinks scene (attracting a relatively refined crowd). This former home for silent film stars rises above Crescent Drive (get it? crescent?) like, well, what it was I guess: a beautiful, opulent home set against sparkly lights and palm trees. I have to admit that I've never been in a room here, but the design downstairs is lovely (and rooms are up a votive-lined staircase), the bar snacks are yummy and an old Hollywood glamour definitely abounds (with modern conveniences like in-room iPod shuffles). MAISON 140: Modeled after a Parisian Inn (what could be bad? 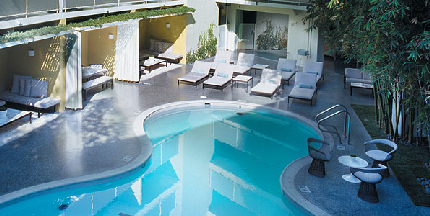 ), Maison 140 is also set on tree-lined streets in BH–blocks from the bustle of Rodeo and Beverly Drive. This is a hotel I don't know quite as well, but I know they throw high-end wine flight tastings regularly and the location is prime. PALIHOUSE HOLLOWAY LIVING ROOMS: So, Palihouse is really a longer-term solution for bi-coastal types during pilot season and the like, but, if you need a spot for a couple weeks or more, this "Urban Lodge" is definitely an amazing choice. Plus, it's next door to Barney's Beanery, an LA standard and age old music industry dive (I once saw Slash complete with top-hat) with menus so long, they're like newspapers–literally. (Pickle-stuffed burger, anyone? Yes, please.) Eclectic hipster appointments (globetrotting relics, they say) and Provencal-style "bar tabac" sit atop spectacular Moroccan tiled floors–and that's just the lobby. This hotel–and its sister property opening soon in Hollywood–is definitely worth checking out . . . or checking in. Sorry, once again, I couldn't help punny myself.